2006 Honda @125. Picture credits - Honda. Submit more pictures. An attractive people mover on any street it travels, the @125 really grabs attention with its modern, curvaceous lines and unique 2-in-1 headlight. Uptown, downtown, anywhere your impulse leads you, the @125 is never out of place, and so well-loved that it�s always on the go. Its spacious, comfortable proportions almost make you forget how lithe and agile it can be, and its elliptical curves conceal a convenient carrying compartment right under its plushly padded seat. Ask questions Join the 06 Honda @125 discussion group or the general Honda discussion group. Get a list of related motorbikes before you buy this Honda. Inspect technical data. Look at photos. Read the riders' comments at the bike's discussion group. And check out the bike's reliability, repair costs, etc. 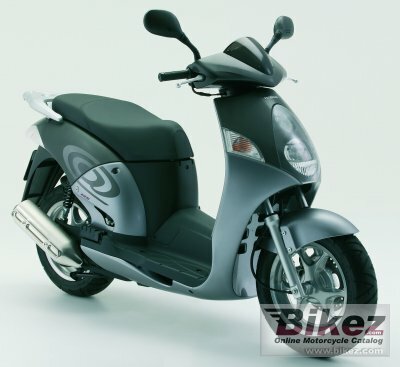 Show any 2006 Honda @125 for sale on our Bikez.biz Motorcycle Classifieds. You can also sign up for e-mail notification when such bikes are advertised in the future. And advertise your old MC for sale. Our efficient ads are free. You are also welcome to read and submit motorcycle reviews.